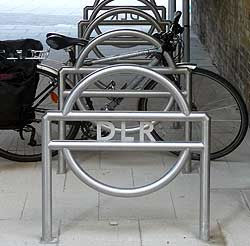 Real cycling: Westferry DLR: The shape of bike parking to come? 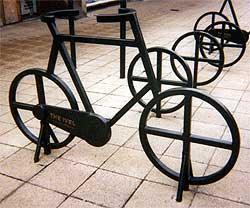 We're suspicious of self-consciously clever shapes for cycle parking racks. This one in Biggleswade (right) must have looked great on paper. But we don't park bikes on paper. In practice it's cumbersome and awkward. However, we approve of these recently installed racks (right) at Westferry DLR station (site of the very first blue strips of London's Superficial Cycleway). The logo just happens to work very nicely as a stable shape to lock up to. 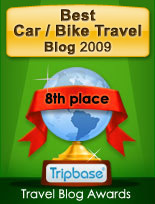 Will the bike parking for the Olympics developments follow suit, and base the shape of its bike racks round the exciting and edgy 2012 logo? That's what you and I call sarcasm; it's what marketeers call blue-sky thinking. Well now there's an idea. 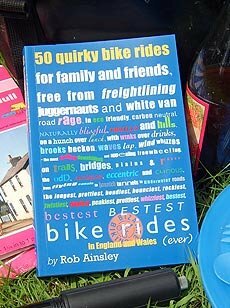 Never mind sarcasm, I'm dreaming up a bike rack design for outside Ann Summers or enlightened establishments offering services of the night to cycling customers. What psychologists call Freudian thinking.